A viable IA candidate must have had previous success at practicing UX design. In Part 1 of this series on strategies for hiring IA practitioners, I revisited the Boersma T-Model for user experience design, shown in Figure 1. My earlier column, “Framing the Practice of Information Architecture,” outlined what I consider information architecture’s six primary areas of interest. I inserted those areas of interest into Boersma’s model to create a more refined view of the IA-practice vertical. While this helped to reduce information architecture’s level of abstraction within the T-Model, I argued that a viable IA candidate must have had previous success at practicing UX design. Hence, it became apparent that, to evaluate the desired skills for an IA practitioner, we need to understand the nature of the high and low tiers of the remaining UX practice verticals. 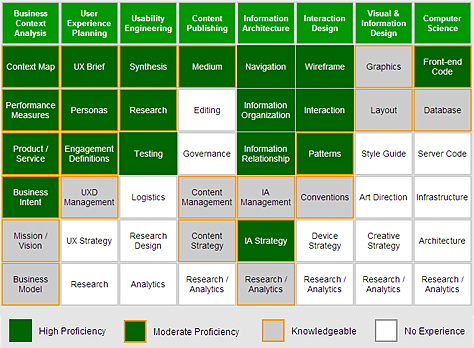 This second installment of my series on hiring IA practitioners, therefore, expounds on the Boersma T-model by presenting a grid that can help hiring managers make informed recruiting decisions by giving them a clear picture of the key verticals of UX practice, while taking into account three potential levels of an IA practitioner’s professional experience. The matrix of UX design skills that are necessary in a candidate for a particular IA role depends on the level of professional experience you want to target for the role. The matrix of UX design skills that are necessary in a candidate for a particular IA role depends on the level of professional experience you want to target for the role. So, when hiring an information architect, consider how his or her level of experience influences the appropriate matrix of UX design skills. I’ll cover these levels shortly. In preparing to write this column, I performed a quick search for guidance on existing definitions of levels of professional experience. Needless to say, I’ll propose new definitions that are based on the subjectivity of my years of practicing information architecture and UX design. 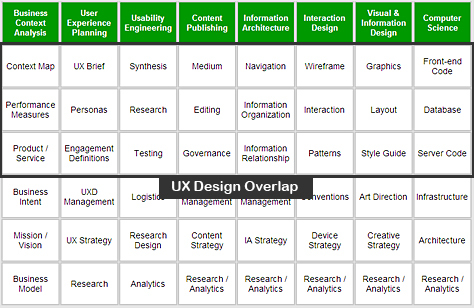 I’ve come to recognize three professional levels within a UX design practice, which Table 1 describes. In the next section, I’ll apply these concepts to a strategy for hiring practitioners of information architecture. This individual has completed some degree of formal training and lab work or has enough related professional experience and a sufficient vocabulary of UX methods to show real potential for becoming a UX professional. This individual has gone beyond formal, introductory training. He or she has some real-world experience and is capable of working productively as a UX professional, but lacks the experience and breadth of understanding to consistently make wise decisions. This person needs more opportunities for growth. This is a wise and seasoned UX professional—with the battle scars and war stories to prove it. 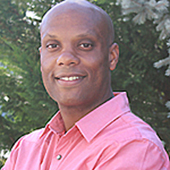 This professional has grown sophisticated and acquired a useful toolkit of approaches for being effective in what they do. I’m going to limit my discussion of the practice tiers relating to information architecture by highlighting areas that are especially important for a tactical IA role. 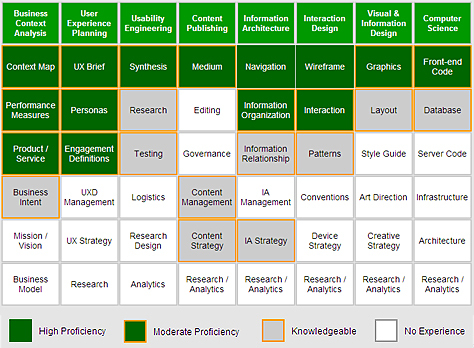 To provide a clearer picture of an IA practitioner’s required competencies based on the levels of experience I’ve just defined, I’ll transform the Boersma T-Model for UX design into a grid that is similar to those I often use in my analysis of information domains. My assumption is that, similar to information architecture, it’s possible to segment the other UX practice verticals into their primary competencies. To test this assumption, I’ll produce what I call an order grid, shown in Figure 2. 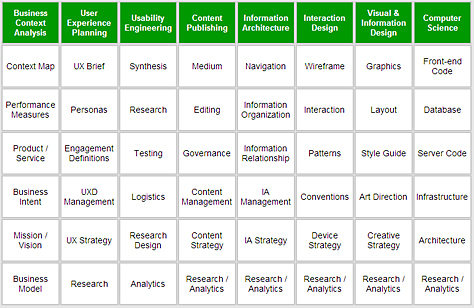 My domain knowledge of UX design has informed my breakdown of the practice verticals and their related tiers. I’ve also evaluated them against two IA frameworks from the DSIA Research Initiative. Download a PDF file containing enlarged versions of all of the practice vertical grids. I used the first framework, organization role segmentation (ORS), to test the fidelity of the individual tiers of each practice vertical, then assessed the relationships between each practice vertical against a second ontological framework. This exercise appears to have been successful, allowing me to begin quantifying the broader domain in which information architecture operates and discuss, with greater precision, the UX design competencies that have the most relevance to an IA practitioner. It’s important to note that the outcome of my process produced one additional vertical, called User Experience Planning, and suggested that Business Context Analysis replace the Marketing & Communications practice vertical of Boersma’s original diagram. The fourth column, Content Publishing, represents copywriting, video, audio, and any other communication media. Finally, I’ve combined Visual Design and Information Design into a single vertical. I’m going to limit my discussion of the practice tiers relating to information architecture by highlighting areas that are especially important for a tactical IA role. The competencies for a manager, strategist, or researcher of information architecture are beyond the scope of this column. Let’s take a look to see how we might evaluate an IA practitioner. high proficiency—The practitioner has high- to expert-level proficiency within a tier, including frequent use of proven methods and models. moderate proficiency—The practitioner has had some experience, but has room for improvement. knowledgeable—The practitioner has had some direct or indirect exposure to a practice tier. no experience—The practitioner has no actual experience. If you’re looking to hire a freshman IA practitioner, make sure that … this person has at least moderate proficiency in the first tier of each practice vertical and possesses at least sound knowledge in the second tiers. If you’re looking to hire a freshman IA practitioner, make sure that—in addition to the unconventional perspective that many in this field seem to have—this person has at least moderate proficiency in the first tier of each practice vertical and possesses at least sound knowledge in the second tiers. In your vetting, the first two tiers help you to evaluate a practitioner’s appetite for cultivating a growing UX design vocabulary, which will prove invaluable in practicing information architecture. Acquiring competency in the first- and second-tiers of each UX practice vertical is a positive step toward professional maturation. If you are considering hiring someone right out of school, Figure 3 represents the minimum set of domain knowledge and skills you’d want to see from a freshman IA candidate. As freshman IA practitioners gain experience and begin to approach a junior level of competency, their focus on developing greater proficiency should begin to aim toward understanding fundamental business strategies and interaction design. Developing a strong vocabulary in navigation techniques and information organization during the junior phase of practice is critical. The baseline competencies of a junior IA practitioner are shown in Figure 4. Developing a strong vocabulary in navigation techniques and information organization during the junior phase of IA practice is critical. It’s also important that Junior IA practitioners begin to build their understanding of the function content strategy plays, as well as its relationship to information architecture. Junior information architects should become knowledgeable about or even moderately proficient in front-end coding for the Web and database modeling. Moderate technical knowledge in the lower tiers of the computer science vertical is vital for information architects who want to move into a role in IA strategy or research. Technical knowledge is useful when discussing data models, designing research for information architecture, or leveraging technical solutions to accommodate IA strategies for complex information environments. Once junior practitioners can close the gaps in their skills in the first and second tiers across certain key practice verticals, they begin to achieve levels of competency that make them ideal IA candidates for senior IA practice. Because senior IA practitioners are often engaged for more sophisticated projects, having a sound approach to understanding business models becomes increasingly important. The competencies for a senior IA practitioner are shown in Figure 5. Because senior IA practitioners are often engaged for more sophisticated projects, having a sound approach to understanding business models becomes increasingly important. Depending on a client’s industry, the business models providing context for IA work may be simple or complex. Product design that involves creating an information architecture for just a single domain may require only minimal mapping to a company’s business model. However, when IA strategies extend across multiple information domains—for example, the domains of a large corporation—effective business modeling of an organization becomes necessary, because information architects must ensure that their solutions map to each organization in a consistent and effective manner. At this, you frequently need to create taxonomies and ontologies and think about metadata compliance. As an IA practitioner advances into more IA-specific responsibilities, UX planning and usability engineering may become less important factors of their competency. However, I recommend that information architects maintain moderate proficiency in these skills. Finally, unless an IA practitioner is moving into a strategy, research, or management role, senior information architects should maintain moderate to high proficiency in wireframing and at least moderate proficiency in interaction design and pattern usage. One Burning Question: What Is the T in the Practice of UX Design? The Boersma T-model implies that UX design is a metapractice that arises from the overlapping areas of interest of multiple disciplines. The Boersma T-model implies that UX design is a metapractice that arises from the overlapping areas of interest of multiple disciplines. To my knowledge, no one has defined where or how deep those overlaps run. Since no one has shown any real evidence of differentiation among these borrowed disciplines, this has led many to think that UX design is either nonexistent or is everything—making it easy to conclude that we are all UX designers. I would posit that the practice of UX design does indeed exist, but it’s not everything. Thus, as a consequence, we are not all UX designers. If we didn’t have what Tom Kelly of IDEO calls T-shaped individuals, who gravitate toward working across multiple practices, we wouldn’t be having this discussion. But, we are. And it’s within our industry of information technology design and development that we recognize a pattern of design behavior that, as the UXmatters glossary says, takes “a holistic, multidisciplinary approach to the design of user interfaces for digital products.” It’s this pattern to which the label user experience design best applies and is best understood. The lower tiers of any given practice vertical do not relate to design, but to management, strategy, and research. 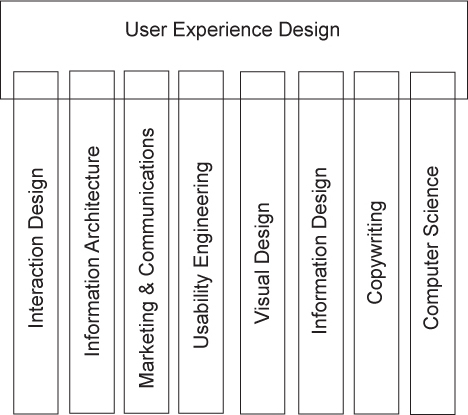 Thus, with the aid of the segmentation of UX design practice verticals that this column describes, the top three tiers of each practice vertical could potentially define the boundaries for UX design as a practice, as shown in Figure 6, and the fundamental competencies of the user experience designer. But since this article is about hiring information architects, I digress. For IA practitioners in search of career guidance, the baseline charts in this article provide direction that should help you close gaps in your competencies and better position yourself for career advancement and professional longevity. Taking a strategic approach to hiring IA practitioners requires hiring managers and recruiters to develop more concrete—and standardized—expectations for the requisite skills that align with what we mean when we say freshman, junior, or senior practitioner. However, a solid perspective on the UX design domain—within which information architects most commonly practice—must inform our expectations. The Boersma T-Model exposes the cross-disciplinary nature of user experience design. With some IA trickery, I’ve expounded on the Boersma T-Model to produce a first-order segmentation. We can use this segmentation of UX design practice verticals both as a maturity model for hiring staff and as a powerful tool for charting pathways for professional growth. 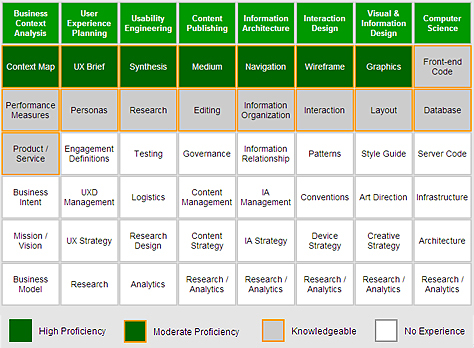 Finally, beyond IA practitioners, the proposed segmentation for UX practice verticals is useful for any professional who operates within the domain of user experience design. And while there are definitely other factors we need to consider in our hiring strategies, I hope this discussion has provided a useful tool for your IA professional’s toolkit. To download the official DSIA poster, Baseline Proficiencies for Information Architecture Practitioners, visit DSIA Research Initiative.